A week of frustrations with nothing really to show for days of working to the point of exhaustion, until at the 11th hour Josh finally got that damn rock we have been whacking for uncountable hours to break free of its stubborn spot blocking our greywater trench. Sore hands and muscles, blisters and mouths full of dust every day, finally we might finish this first important thing sometime next week. So much for having it done months ago. 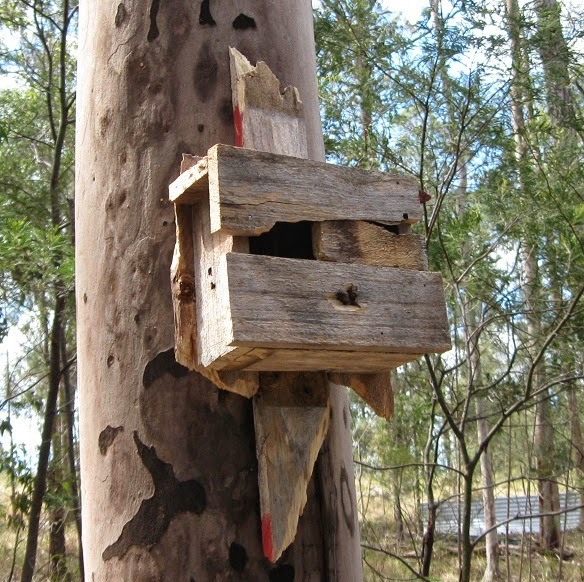 I amused myself at the end of one day by knocking together some random broken bits of wood and making up a little bird house, which was actually much easier than I thought it would be. No birds or animals seem to have gone near it yet, unfortunately I wasn't able to nail it especially high up in the tree. Maybe I can move it when we have a ladder here. Which might happen very soon - mum-in-law is planning a visit and we are very excited. Both to see her, and to have her see the property for the first time, but also because she will be bringing up heaps of useful stuff that we have had frustatingly sitting around in Sydney all this time. Such as a ladder! The magicalness of everyday is not wearing off yet, what with the birds and the insects and the flowers and the bettong and bandicoot that Josh saw while making dusk phone calls. The scraps we put into the compost keep appearing in random places around the sheds, and an avocado skin was even dragged inside the annexe. Apparently these little creatures are not scared of us humans. The swallows might be now though, since their bub has fledged and they spent a night out in the wild instead of their mud nest inside the shed I took the opportunity to knock down the nest. I didn't want to be mean to them, but they were shitting all over our stuff, and we are going to be putting even more stuff in there soon. They will have to remember what it means to live back in nature again! I felt so bad that I made some little tree shelves and nailed them up, so if they want they can build their nests with some human help in the outdoors.